Our couple (pictured) got married at the Jacksonville Zoo and Gardens. They loved geeky stuff. The guys all had shirts made with their gamer names on them and as the reception wore all the suit tops came off exposing the shirts. They love Jurrasic Park and all things Disney. 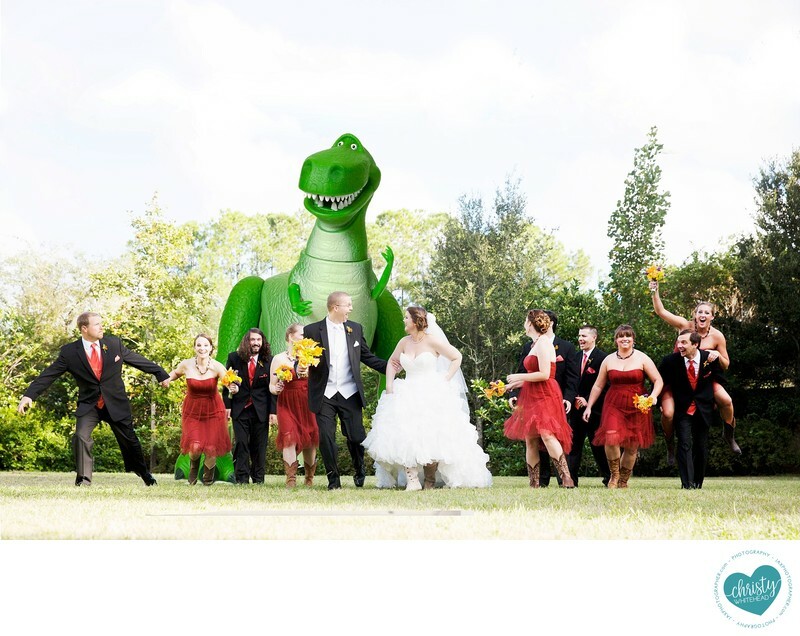 We did this shot with them running from Trex as well as this fun one with the Toy Story rex. Just because you love cool stuff like Disney, Harry Potter or Star Wars, doesn't mean you can't infiltrate that into your wedding to make it uniquely yours! Studies say, people who fall in love with geeks say they are more intense and passionate. Be proud of your geekiness with a geeky wedding. However, you do not have to be a geek to have a clever wedding that will leave your guests with a smile. Star Wars, Lord of the Rings, comic books and geeky games make for a quirky presentation, try upping your wedding's nerdy level with these easy ideas and tips. What better way to prepare your guests for a nerdy wedding than with wedding invitations. Prepare your guests for what they are walking into! Make library card themed invitation cards complete with date stamps. Other ideas are robot cards, invite info written on old school tapes! Plan your wedding during the summer holidays, and you can arrange with a college principal to use the institution as a wedding venue. It does not have to be boring either. You could have your groomsmen dress in their fraternity suits. The lab would form the perfect background for wedding shots with cleverly arranged science apparatus. We've done a wedding here at a local high school. The Jacksonville public library allows weddings downtown. I've also shot a wedding at the Ponte Vedra library. Movie theaters allow rentals, so you could probably do something fun with that! You can get very creative with boutonnieres. Action hero figures like Superman or Batman, or Star Wars Jedi’s will make very interesting lapel accessories. Legos would be fun! You can match these with cufflinks from the same movie or comic book. We've had guys with superhero shirts under their wedding attire. Legos are a fun one. You could do all kinds of stuff with them. The wedding cake is the perfect platform for creativity. Perch an action figure at the top. An R2D2 would be the perfect centerpiece for a Star Wars themed cake. We've had two lego figures. We've seen couples play their favorite movie themes. You can even get classical versions of them. I've heard of guests putting light sabers above the aisle as the couple walked under them to exit. That would be fun. Show the seating arrangement as a periodic table--perfect for a science wedding, complete with your guests’ two initials, forcing them to take a closer look at their names in smaller print. You can also make Lego seating cards. Name your seating arrangements with inspirations from the Game of Thrones. You can place a few items on the tables for your guests to play with, for example, mini-Legos or scrabble. Play mock fights using light sabers just like the Jedi and Sith lords with two opposing sides of the wedding troupe. It will make for very interesting pictures. You could have all kinds of oversized games like Jenga or Twister (great after a couple of drinks! Think about the photos, ha!). Location: Jacksonville Zoo and Gardens.